JAKARTA, INDONESIA, Mar 5, 2014 - (ACN Newswire) - SkyTeam, the global airline alliance, has welcomed Garuda Indonesia as its 20th member and second airline from Southeast Asia. Garuda's membership adds Jakarta as an alternative gateway to and from South East Asia, as well as 40 new destinations to SkyTeam's global network served uniquely by the alliance. 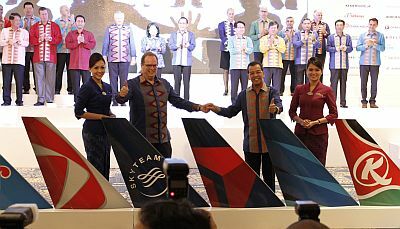 "Garuda's entry into the alliance will give its customers access to SkyTeam's 1,064 destinations, covering over 90% of the most relevant traffic flows in the world," said Michael Wisbrun, SkyTeam's Managing Director. "Garuda strengthens our presence throughout the Asia Pacific region for our 588 Million global passengers." "SkyTeam aims to boost its members' competitiveness by strengthening network and hubs, enhancing its global footprint, improving customer experience and introducing innovative initiatives that enhance customer benefits," said Mr. Wisbrun. "Today is a historic and momentous event for Garuda Indonesia as we are now officially becoming the 20th member of SkyTeam. For these past 3 years, Garuda Indonesia has been actively forging cooperation with the other 19 member airlines with this objective in mind, and it has been an incredible journey," said President & CEO of Garuda Indonesia, Emirsyah Satar. "Joining SkyTeam is part of Garuda Indonesia's progressive transformation program throughout all aspects of the company. This milestone marks a momentous occasion in our airline's 65-year history and we look forward to a future collaboration with our alliance partners." "Garuda Indonesia is now able to offer customers global reach with a seamless and even more convenient travel experience, while at the same time establishing Indonesia firmly on the map of world-wide air travel. Moreover, becoming a member of SkyTeam will further strengthen Garuda Indonesia's reputation as a "World-Class Airline", and puts it on par with other leading global airlines. Garuda Indonesia is proud to connect SkyTeam's global extensive network to one of the largest economies in Southeast Asia via its hubs in Jakarta, Denpasar, Makassar, Medan, Surabaya, and Balikpapan," said Mr. Satar. Garuda flies to 64 destinations in 12 countries, including 40 domestic destinations. SkyTeam customers from every continent will benefit from easier access to Indonesia's key business and tourism destinations, facilitated by Garuda's partnerships with alliance members. The airline boosts SkyTeam's presence in Australia with service to Brisbane, Melbourne, Perth and Sydney; and in Tokyo with flights to both Narita and Haneda airports. Garuda will increase its service to Europe in May this year with a new route between Jakarta and London's Gatwick airport. As part of the requirements of joining SkyTeam, Garuda is implementing the alliance's customer-focused initiatives. These include SkyPriority - priority airport services for Elite Plus, First and Business Class passengers worldwide - which has been rolled out at over 900 airports globally. Effective immediately, Garuda's 19 million annual passengers will be able to earn and redeem miles when flying on SkyTeam member-operated flights. Members of other SkyTeam airlines' frequent flyer programs can also earn and redeem miles when flying on Garuda Indonesia operated flights. SkyTeam is a global airline alliance providing customers from member airlines access to an extensive global network with more destinations, more frequencies and more connectivity. Passengers can earn and redeem Frequent Flyer Miles throughout the SkyTeam network. SkyTeam member airlines offer customers access to 564 lounges worldwide. The 20 members are: Aeroflot, Aerolineas Argentinas, Aeromexico, Air Europa, Air France, Alitalia, China Airlines, China Eastern, China Southern, Czech Airlines, Delta Air Lines, Garuda Indonesia, Kenya Airways, KLM Royal Dutch Airlines, Korean Air, Middle East Airlines, Saudia, TAROM, Vietnam Airlines and Xiamen Airlines. SkyTeam offers its 588 million annual customers over 15,700 daily flights to 1,064 destinations in 178 countries.